"Take it from me, a bit of give in your shirt is a godsend: whether it’s for a comfortable bike ride, newly-discovered muscles or – dare I say it – a bit of extra leeway at the midriff. These 100% cotton shirts have a wonderful natural stretch for unrestrained comfort, while our special garment wash ensures they arrive exceptionally soft." "100% cotton shirt made with a comfortable natural stretch; non-iron and finished with our special soft wash for a soft hand feel." Material is nice and soft, very comfortable. 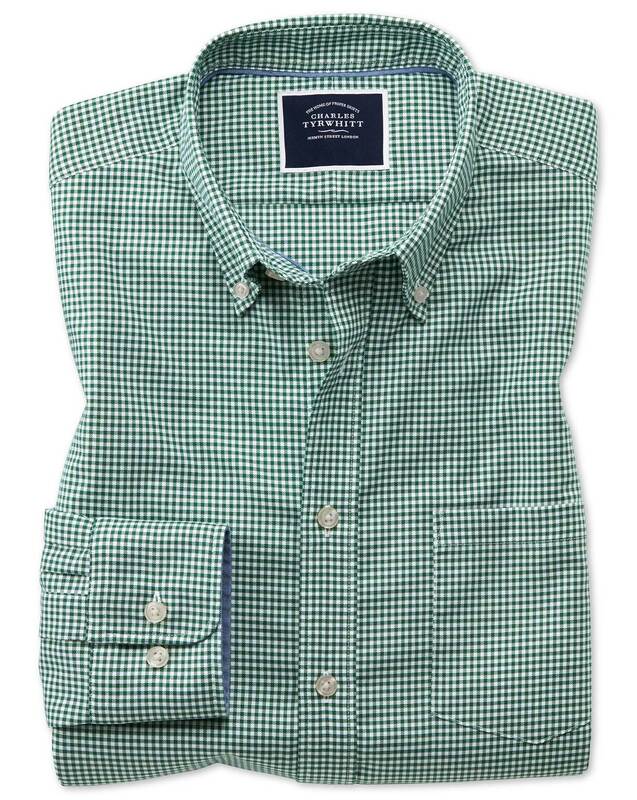 Great green colour and the gingham pattern is nice in that it is not too large. Lovely alternate colour lining on the cuffs and small details like buttonhole stitching, appear to be decent quality. Very comfortable shirt to wear. Non-iron is also good in that after washing, all I had to do was hang to try on a wooden hanger and the shirt dried in shape without creases. Like all of the shirts I have purchased from you very good.